Area : 3780 sq. km. Temperature : Max. 43°C and Min. 26°C in Summer. Max. 25°C and Min. 9°C in Winter. Rainfall : 47 cms to 76 cms. Clothing : Light Tropical in Summer. Light Woollen in Winter. Best Season : October to February. Dungarpur was founded in 1282 A.D. by Rawal Veer Singh. Nestled in the foot hills of the Aravallis, the place has an interesting topography, ranging from wild and rugged terrain in the north-east to fertile plains of alluvial soil in the south-west. Two magnificent rivers – the Mahi and the Som flow through the area. The area is rich in teak, mahua, mango and khajur trees. Dungarpur is also noted for its wildlife variety. It is a home of commonly seen bird variety and various migratory birds. Dungarpur is famous for its unique style of architecture as seen its palaces and noble residences. Air: Udaipur 120 km is the nearest airport. Regular flight services connect the place with important cities of India. Rail: The place is well connected by rail through Udaipur and Ahmedabad. The Railway station is 3 km from the city. Road: National and state highway connect the place with several cities within and outside the state. Bus and taxi are available. Udai Bilas Palace: The royal residence named after Maharawal Udai Singh II, a patron of art and architecture. This Rajput architecture ornate with intricately sculptured pillars and panels. Juna Mahal: The 13th century seven-storied structure is a treasure house of frescoes, miniature paintings and mirror work. 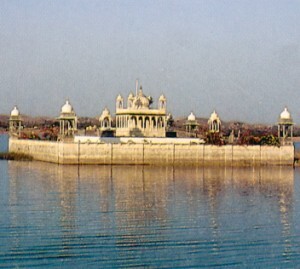 Galib Sagar Lake: A famous lake. One shrine lies along the lake. There is a temple dedicated to Lord Shiva is an architectural splendour. Govt. Archaeological Museum: The museum houses a fine collection of ancient statues. Bhuvaneshwar: Bhuvaneshwar is situated 9 km from Dungarpur. A famous temple of Lord Shiva is situated here and is the venue of a colourful fair held on the 15th day after Holi. Deo Somnath: bDeo Somnath is situated 24 km from Dungarpur. A splendid 12th century temple of Lord Shiva built in white stone is Deo Somnath. Baneshwar: Baneshwar is situated 24 km from Aspur and 60 km of Dungarpur district in Rajasthan. At the confluence of the Som and Mahi rivers where stands the Baneshwar temple with Shiva Lingam. Other than the temple some ancient temples are also located there. It is visited between the month of January and February when a tribal fair of the Bhils is held. During the fair magic shows, acrobatics and a sale of traditional weapons at spice to the ambience. Poonjpur: Poonjpur is situated 37 km from Dungarpur. 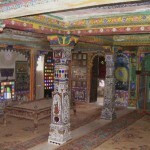 A temple dedicated to “Mavji” preserves the manuscript of a book ‘Chopra’ written by “Mavji”. Baroda: Baroda is situated 41 km from Dungarpur. An erstwhile capital of Vagad, the village has some ancient beautiful temples built in white stone. Galiyakot: Galiyakot is situated 58 km of Dugarpur in Rajasthan. This tiny village is renowned for its magnificent shrine of Sayed Fakhruddin. 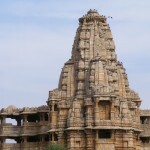 The Jain temples close by are also a worth visit. This entry was posted in Dungarpur, Rajasthan and tagged Baneshwar, Baneshwar Fair, Deo Somnath Temple, dungarpur city, dungarpur india, Galib Sagar Lake, Juna Mahal, udai bilas dungarpur, Udai Bilas Palace, udai bilas palace dungarpur. Bookmark the permalink.